Shall we begin? With episode #62, Game of Thrones explores titles. “Stormborn” is a title that Daenerys Targaryen earned by surviving being born during a large storm at Dragonstone some 22 years earlier in the show’s chronology; her mother Rhaella did not survive this traumatic event. 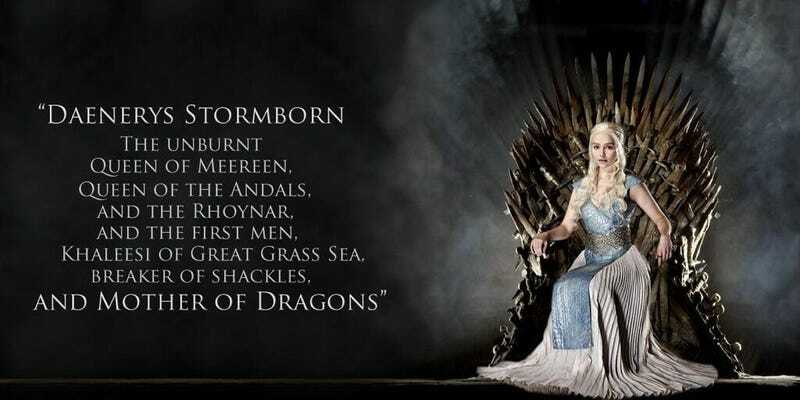 The other titles that Daenerys espouses are a mixture of ones she was born to inherit and ones she has gained in her life. In Westeros, do any of these titles mean anything? Or are they just wind if there is no power behind the words? The show wants to remind you why Daenerys is called Stormborn, so Tyrion, Varys, Grey Worm, Missandei, and Daenerys watch a storm at night, and comment on the storm that happened when Daenerys was born. Varys remembers that it was a bad night in King’s Landing to the southwest; there’s your reminder that when Daenerys was born and the usurper Robert Baratheon sat on the throne, Varys was there. Varys reminds the audience that Cersei controls less than half of the Seven Kingdoms; maybe 2.75 if we’re literally counting the old kingdoms. Daenerys correctly points out that even if the people of Westeros dislike Cersei, there is no guarantee they will like her. Tyrion and Varys are pushing for a box-Cersei-in strategy; work with the houses that are already against the Lannisters to hold in the Lannister threat and then constrict upon King’s Landing until it is defeated. Tyrion mentions the Reach and Dorne and does not mention the North and the Vale at all: either everyone is already aware that they are anti-Cersei, or he forgot. I will assume it’s the former. Daenerys chooses this moment, this moment right here, to ask Varys if he is truly Team Daenerys. This seems like an odd time to bring it up (they did just share a ship on a long trip from Meereen to Dragonstone) but she wants Tyrion, Missandei, and Grey Worm (and the audience) to know that she will perform a public performance review on you, at random, without warning. Melisandre, as a former slave, is glad to meet Daenerys, the Breaker of Chains. Once she says her name, Varys reminds Daenerys that she once worked with Stannis: “It didn’t end well for Stannis Baratheon, did it?” That’s a bit harsh, Varys, Season 5 was brutal, almost no one made it out alive. Daenerys asks Melisandre what the Lord of Light wants, Melisandre mentions the prince who was promised, Daenerys makes a comment on how she is not a prince, and then Missandei becomes the MVP of the episode by breaking out her Masters in Valyrian Studies degree to remark on how, (pushes up glasses) in High Valyrian the noun in that prophecy has no gender. Daenerys likes that; she asks Melisandre if she thinks Daenerys is the princess who was promised, Melisandre says that Daenerys has some role to play, as does another: the King in the North, Jon Snow. Tyrion looks surprised to hear that Jon Snow (who he last spent on-air time with in Game of Thrones #3) is now the King in the North. This … insinuates that somehow he was unaware of current events in the North: how out of the loop is he? Did he think the Boltons still control the North? Is that why he didn’t mention that the North is not loyal to Cersei earlier? When Varys said that only half of the Seven Kingdoms are allied with Cersei was he counting the North? Okay now that Tyrion knows that Jon runs Winterfell he is 100% promoting the notion that Daenerys summons Jon southward. He had no idea that Jon ran Winterfell; it’s a good thing Melisandre showed up to deliver this information. Daenerys is like yeah sure have him come to Dragonstone and bend the knee and the audience is supposed to be aware that that is unlikely so let’s cut to Winterfell. At Winterfell, children are practicing their archery, because they are aware that wights, unlike zombies and skeletons, have no damage reduction. Sansa, Jon, and Davos are reacting to the message that Tyrion sent. Is it a trap? Sansa agrees with Jon that Tyrion probably sent it, but she also says it is too big of a risk for Jon to go south. Davos doesn’t like the sound of the threat of the Dothraki horde, legion of Unsullied, and three dragons. Do Davos, Jon, and Sansa just accept that Daenerys has dragons, which have not been in Westeros for one and a half centuries? It sound like they do, which, sure, why not. Davos says that those dragons might be needed to stop the army of the dead, if somehow they spill south of the Wall. In King’s Landing, Cersei (with Qyburn and Gregor) has called up some of the smaller noble houses to warn them of the threat of Daenerys. In particular she seems focused on talking to the smaller houses of the Reach, to talk them into abandoning their allegiance to the Tyrells. Cersei is trying to sell Daenerys as the next Mad King, since no one likes Aerys II. Randyll Tarly points out that Daenerys has three full-grown dragons; once again everyone in Westeros seems okay with dragons being real. He asks how Cersei plans on stopping them, Cersei looks over at Qyburn, Qyburn says that “we” are currently at work on some kind of solution. Jaime wants to chat with Randyll. Randyll listened to the summons he was given, by Cersei, because he knows what happens to those who defy her… Jaime and Randyll have a walk and talk and both of them just want the other to get to the point. Jaime wants Randyll to be his top general in “the wars to come”, the show’s favourite phrase, and to fight against all of Cersei’s enemies. Randyll is unwilling to oppose House Tyrell; unlike some Lannister lackeys, he will not compromise his values. Jaime tries to tell him that there is no compromise possible: House Tarly is either fighting for Cersei or for the foreign savages and eunuchs. If Randyll is willing to overthrow House Tyrell, Jaime will vouch for House Tarly becoming the new Warden of the South. Archmaester Ebrose says that Jorah is doomed, with less than 6 months before his mind is warped by the greyscale. Samwell is like “I know a young child who was cured of greyscale” and Ebrose is like “what was the sample size on that study” and Samwell is like “Well I saw it on my Facebook feed” and Ebrose reiterates that Shireen’s case of greyscale was caught at a very early time and that Jorah is doomed. Ebrose says that smallfolk with greyscale would be sent to Valyria to die, immediately (did Jorah just get there yesterday?). But since Jorah is a noble then he gets … a day, before he is sent to Valyria to die. Samwell doesn’t know the name of this patient who he is attending; when he hears the last name Mormont he becomes a bit speechless. Qyburn leads Cersei into the cellars below the Red Keep, where the dragon skulls are kept. It’s been a while since the show visited this location; in Game of Thrones #5, Arya overhead Varys and Illyrio plotting down here. Cersei makes reference to Robert Baratheon placing the dragon skulls down in the cellars and also visiting the cellars with his whores; BookTyrion did the latter with BookShae, maybe that’s what the show is referencing. They come across a really large dragon skull which Qyburn calls Balerion the Dread. At first I assumed this was Qyburn being a bad Maester (the book name for the dragon is Balerion the Black Dread) but previously on Game of Thrones (in #4, #26, and #30) characters made mention of Balerion the Dread. So I guess it’s just the show being internally consistent. Qyburn knows that Drogon was injured in the fighting pits of Meereen (Game of Thrones #49) (also, who told him?) and so he has had the best engineers in King’s Landing building a ballista. She fires the ballista and it pierces the skull of Balerion, stopping inside the skull (it looks like it barely pierces the back of the orbit after it entirely pierced the front of the orbit). This is a two hundred year old skull which has been stored in a variety of not-helpful-to-bone-integrity places and the ballista bolt doesn’t actually travel all the way through it and yet Qyburn and Cersei look impressed because they didn’t study comparative anatomy oh wait Qyburn did so maybe he’s just glad that Cersei doesn’t recognize that his weapon isn’t that good. Anyway let’s leave the Red Keep. A large number of Daenerys’s allies have shown up at Dragonstone: Yara, Theon, Ellaria, Olenna, Varys, Grey Worm, Missandei, Tyrion, and Daenerys herself looking out the window. Yara pushes for the blitzkrieg plan; they have an army (I think she’s referring to the Unsullied), a fleet, and three dragons. Tyrion says that the dragons loosed on King’s Landing will result in tens of thousands of civilian deaths. Ellaria says that’s war. Tyrion says that war isn’t poisoning little girls; these two still have some unresolved hostilities and Daenerys tells them to put a sock in it. Daenerys uses Tyrion’s earlier “Queen of the Ashes” quip (he gives an approving glance) to say that she won’t burn King’s Landing to the ground. Olenna pulls an Olenna and says that fear, not love, is the only path to obedience. Everyone’s nodding at this plan??? This is the plan? No one mentions the entirety of the North or the Vale, either as potential allies or potential hindrances to this plan. I guess everyone in this room is aware that the North and the Vale are not pro-Cersei, so, why are they not being asked for some kind of support? No one mentions Euron Greyjoy’s fleet. That suggests no one is aware that it exists, even though within the past ~half year of the show’s timeline its thousands of pirates and hundreds? of ships would have sailed from the Iron Islands to King’s Landing, past the Reach and Dorne. Apparently far far away from any cities or naval routes of those two somewhat highly-populated areas. No one just straight up asks why this meeting of the minds was necessary. Enough time has elapsed since Olenna and Ellaria met, supposedly to align and start planning a joint military campaign against Cersei, for Varys to travel to Meereen and travel back to Dragonstone. Where is that joint military campaign? Why have Dorne and Highgarden not already assembled a large army and started moving it towards King’s Landing, especially if Tyrion’s plan is for Highgarden’s army to travel overland to King’s Landing? Olenna and Ellaria just traveled to Dragonstone to … get told to go back to Highgarden and Dorne. Maybe two ravens would have sufficed there. Ellaria and Olenna just left places where they were safe to get told commands (“Ellaria, get your army ready to go on a boat. Olenna, get your army to start marching towards King’s Landing”) that could have easily fit on ravens. Dorne and the Reach are in open revolt so it’s not like Dragonstone should be worried about those ravens being intercepted. Oh Daenerys wants to have a one-on-one short chat with Olenna, that’s why she called Olenna there. Olenna gives really good advice: ignore clever men. (But Olenna just agreed to the military planning of a clever man?) She tells Daenerys to not be a sheep, but instead be a dragon. Everyone who guessed that that scene was of Grey Worm sharpening a dagger, take a shot, you were correct. Missandei wants Grey Worm to just tell her he likes her GREY WORM JUST TELL HER, DUDE. To be 100% fair to Grey Worm he has some major childhood trauma that he’s still working through so this scene is super sweet, as two people just tell each other the simple fact that they’re afraid they will never see each other again. They disrobe and bang with the door open because the show is one big exhibitionist exercise and it’s also meta. Ebrose is having Samwell grab some books at the library in Oldtown. Exactly how Samwell’s Maester training is proceeding is still unclear; is it a master-apprentice thing wherein Ebrose is teaching Samwell certain things? Ebrose is apparently planning on writing a history book and Samwell hates the title. Samwell says hey Ebrose I think I can cure greyscale I read this book and Ebrose is like hey do you know how the author of that book died and Samwell is like nope and Ebrose says he died of greyscale and that the procedure is forbidden. So Samwell goes to Jorah’s cell that night to perform the procedure. Samwell tells Jorah that he was there when his father died and he doesn’t want to give up on Jorah, so Jorah please drink this entire bag of rum because this procedure is gonna hurt a lot. So it hurts a lot. Maybe the show was worried it had no torture this season so instead we get “very painful medical procedure” instead. Apparently the procedure involves removing the “scales” and then applying an ointment to the skin under the scales; Samwell very oddly chooses to start the procedure at a random spot in the middle of the infected area instead of at an edge of it; probably because he is only training to be a Maester. Remember last week when the show’s introductory scene briefly flew past the Inn at the Crossroads? Well this week the show actually takes place at the Inn at the Crossroads, and Arya gets to meet her baker acquaintance, Hot Pie. Arya makes a Frey pie joke; somewhere in a parallel universe Wyman Manderly is annoyed. Arya and Hot Pie have a mostly one-sided conversation until Hot Pie asks why Arya isn’t going to Winterfell. “The Boltons have it,” Arya says. “No, the Boltons are dead.” “What?” Somehow Hot Pie is more in the know than Arya, probably because Arya rolled a very low Gather Information check earlier. Now aware that her supposed half-brother is the King in the North, she stops going towards King’s Landing to kill Cersei and instead starts towards Winterfell. Jon gets a raven from the Citadel; Samwell told Jon about how Dragonstone is one big deposit of dragonglass. Jon talks to his bannermen. They take the news about Dragonstone having dragonglass pretty well. They take the news that Daenerys Targaryen has three dragons less well (thank you, Stark bannermen, for showing incredulity about an outrageous claim). Jon says that he’s going to Dragonstone to get the dragonglass. And get allies. Sansa reminds Jon that their grandfather (accurate!) got invited to meet with the last Targaryen king and he got burned alive. Jon doesn’t think it’s a trap. Yohn Royce agrees with Lady Sansa: neither Targaryens nor Lannisters can be trusted. It really sounds like everyone in this room does not want Jon to leave. Jon argues that he has to leave because the North doesn’t have enough people to defend itself against the army of the dead. “Then send an emissary,” Sansa says, wisely. “Only a King can convince a Queen to help us,” Jon says, maybe less wisely because he’s not aware that Daenerys does not like to share authority. Jon leaves Sansa in charge of Winterfell. Before Jon leaves he goes to visit Ned’s statue in the Winterfell crypts. Baelish, of course, intrudes on Jon. Jon says that Baelish shouldn’t be there and Baelish says that they should talk, properly. Jon has nothing to say to Baelish (Jon just gave a speech about how the North needs allies, and Baelish is one of those allies, but he’s not the kind of ally Jon likes), Baelish reminds Jon that he’s only alive because of Baelish’s troops and that he loves Sansa and of course that’s where Jon assaults Baelish and tells him to not talk to Sansa. And Jon leaves? After just assaulting one of his allies? Alright well okay uh what could go wrong in Winterfell with Jon leaving, it’s not like the place completely fell apart the last time Jon left it. Next up on the Arya reunion tour is her reunion with the direwolf Nymeria who, six years later, is understandably much larger than she once was. Arya tells Nymeria that she’s going north, back to her home Winterfell. She invites Nymeria along but Nymeria is like nah. “That’s not you,” Arya says, coming to some kind of epiphany that her ‘pet’ direwolf has had six years to grow into her own life. Nymeria has her own, non-Arya-based concerns, and while Nymeria does not wish any harm upon Arya, Nymeria also has no interest in Arya’s concerns. Direwolves aren’t people, humans aren’t direwolves, and the Cleganebowl will never happen. We have to check in on the Yara fleet. After an establishing shot to show which fleet of kraken-displaying ships this one is, we jump below decks on a ship. There, the Sand Snakes argue amongst themselves over who they will kill in King’s Landing. Somewhere else, Ellaria is annoyed that she’s been given low quality liquor. Yara and Theon both seem fine with it. I think Ellaria is flirting with both Yara and Theon? Oh wait no she’s just primarily flirting with Yara; oh no the ship just got attacked. There’s a moment wherein no one is sure who is attacking them (?) and then Yara says it’s Euron. His lead ship (?) rams into Yara’s ship and then he uses a boarding plank (while screaming “Yeeeeeorgh!”) to board Yara’s ship and then his Ironborn are fighting their Ironborn and I don’t know how we’re supposed to make sense of this naval battle at night between two forces that look very similar is that the point? Is Game of Thrones just reminding us that war is pointless? One of the Sand Snakes, Tyene, shows up on the deck of the ship, she kills someone, Yara tells her to keep Ellaria safe. So Tyene goes downstairs, followed by some of Euron’s men. We cut away from that potential fight to see that the rest of Yara’s fleet seems to be losing. Yara does not lose hope! She keeps the fight up. Nymeria whips Euron! Obara stabs at Euron! Euron kills Obara. Then he kills Nymeria. Then his troops overwhelm Tyene and take her and Ellaria hostage. Euron and Yara spar and Euron ends up with the upper hand. Euron screams at Theon and basically makes him choose between leaving the ship or getting Yara probably killed and Theon leaves. We get to watch Theon look at Nymeria and Obara’s dead bodies, and Euron’s flagship leave, with Euron taking Yara, Ellaria, and Tyene back to King’s Landing as his presents to Cersei. Multiple times between the end of last season and the beginning of this season, the fandom had to ask the question of how Cersei has any chance of persevering against Daenerys. The answer turns out to be: Cersei allied with Euron, and Euron has a large and apparently unknown fleet, and that fleet will crush one of Daenerys’s pillars of strength.